Some of us have a budget to consider when booking holiday accommodation, but that should not prevent us from enjoying modern conveniences, absolute comfort and a good location with great views. While staying lavishly in expensive beach resorts is an enticing idea, our list of the best 3 star hotels in Phuket will meet all your expectations and even exceed them. 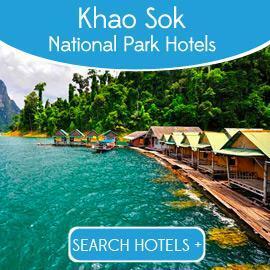 One may consider these to be cheap resorts, but they offer all the comforts of home in spacious rooms featuring satellite TV, internet access, mini bars and thoughtful extras like laundry services to make an affordable holiday in Phuket convenient. You may expect rooms to be tasteful and comfortably equipped and many offer breathtaking views from private balconies. At many 3 star resorts you may also look forward a divine beachfront setting like any of your expensive neighbours, but at a fraction of the cost. 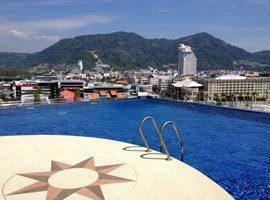 Located in Patong offering cheap accommodation for couples and families wit a junior suite sleeping 4 and the family suite accommodating 2 adults and 2 children. Has a rooftop pool and swim-up bar. 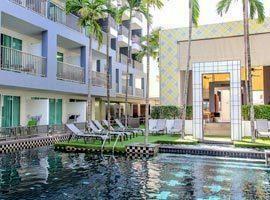 A moment's walk from the beach and near nightlife in Bangla Road Andatel Grande features direct pool access rooms, private balconies, en-suite bathrooms and free Wi-Fi internet access. 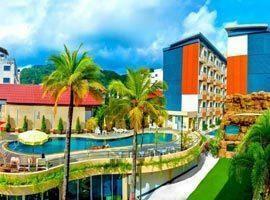 In the centre of the entertainment, near nightlife area and Jungceylon shopping mall. Deluxe rooms and junior suites have private jacuzzis. The heavenly spa pool feature fountains and swim-up bar. Steps from Karon Beach featuring a rooftop pool, a spa and a first of its kind sky lounge allowing stunning ocean sunset views. Deluxe rooms are hip and stylish and there is a 2 bedroom family suite. 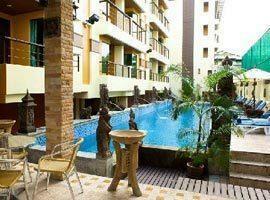 Walking distance from entertainment and nightlife. Standard rooms come with 2 single or a double bed, the family room include bunk beds and many rooms have inter-connecting facilities. 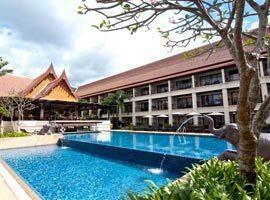 Modern Thai styled rooms within easy walking distance of the beach and entertainment district. 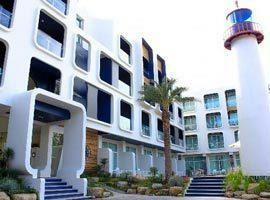 It offers well appointed deluxe rooms and studios and also offers a duplex family studio. 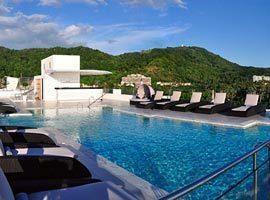 Located in Kata Beach this modern and trendy designer hotel features a stunning pool with sundeck and jacuzzi. Room interiors are chic and intimate and there are rooms with direct pool access. 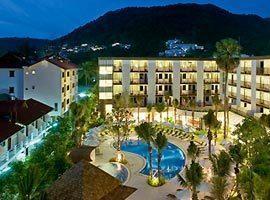 This themed budget hotel in Kata Beach offers deluxe rooms with private balconies as well as pool access rooms. It offers restaurants, a gym and pool with a compass design which lights up at night. Located in the heart of Patong, near the Jungceylon shopping and entertainment centre, Banzaan market and nightlife in Bangla Road. Rooms feature extensive facilities and suites come with a kitchenette.